The house on Rios wasn’t much of a house at all. It was a brown duplex, a long rectangle built from two squares, and I lived in the back one. It smelled like old, cheap beer and stale cigarette smoke. Most of the smell was from us, but some of it was from the once black now faded and multi-stained futon sofa we picked up on the street. If you walked by the house from 1994 to about 1998, you would most likely hear some 90s Warped Tour pop punk, Biggie, Snoop, or Dre and you would most definitely smell weed. One of the benefits of this house was that it was across the train tracks from the beach, Pizza Port, pick up basketball at Pillbox, and Mai Tai Mondays at Tidewater. Another benefit was that it was across the street from a group of old apartments, like the one I lived in, but instead of faded brown, they were a faded yellow. A group of Mexican families lived there, and there were always kids running through the dead grass courtyard in front of the group of apartments. On Saturdays, a Mexican baker would come around with a cart full of sweet bread and would yell something in Spanish, and it always seemed too early, but I would still roll out of bed and soak up the hangover with some of the sweet Mexican bread. By far the greatest benefit of this house is that a half mile down, the asphalt dead ends and a trailhead begins. When I started running, the trail was always empty. Those first couple of runs, I couldn’t even make it to the trailhead, but as I gained fitness, and as my lungs rid themselves of the cigarette damage, I could venture further and further into the lagoon. The miles were hard and slow, but it helped that the lagoon trails were so beautiful and quiet. The San Elijo Lagoon trail was narrow with sections canopied by cottonwood and sycamores, sandy in some places, and packed dirt and leaves in others. You can see the ocean from many parts of the trail and trace the sea water path as it transitions to salt marsh and grassland. You can also catch glimpses of the massive underbelly of the traffic-jammed I-5 Freeway. It’s right there, but the lagoon is so perfectly hidden that there are times when you feel like you are hundreds of miles from people and anything that runs by engine. I would return after I moved, and as I got faster and trained more. I joined a group of triathletes on the other side of the lagoon for their regular 11-mile Sunday run. Pros would show up as they tuned their bodies for the Ironman Championships in Kona, and it would be painful and fun to stand in a group with elite athletes, pre-run stretching and listening to the stories and then starting together, trying to keep up for a mile or two, then watching their backs disappear around the turns as their warm-up pace increased to an easy Sunday run pace. I saw Meb running those trails once. Meb, one of the top American marathoners ever, sharing the same trail with me. I didn’t dare test my speed with his as he glided by on what for him was a recovery pace, but to me seemed superhuman. 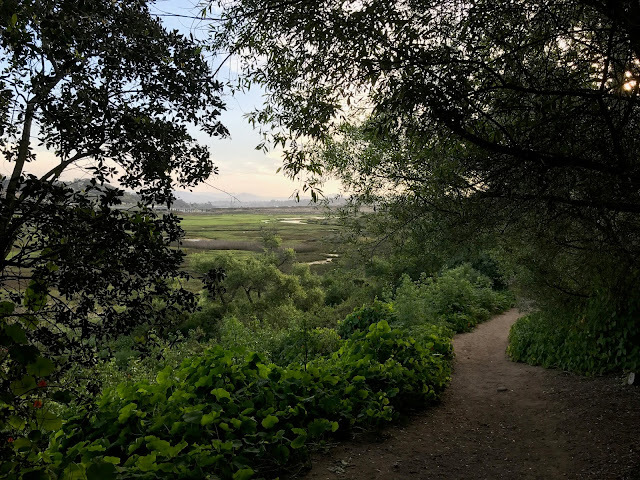 I saved important runs for the lagoon, and as the trail became more well-known and crowded, I had to dodge hikers, run as soft as I could past birdwatchers, and smiled at the children catching crawdads along the reedy shore. When my wife’s parents came from Iran to meet our second child, my infant son for the first time, we took them on a hike through the lagoon. 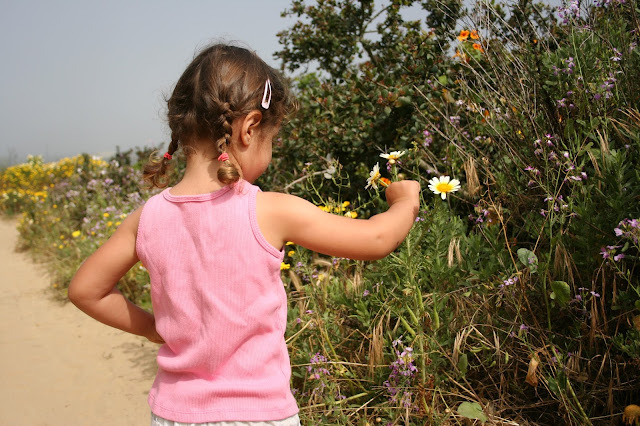 My older daughter picked a daisy and put it behind her small ear, and my wife wrapped my baby boy in a sling and kept him close to her body. I thought of that hike today as I took my three children, all currently in love with running, to the lagoon. With the popularity of the trail, the local parks department has refurbished the trail, making new signs, opening new trails, and lining the trails with wooden posts and steel cord in case the trail itself was lacking in instruction on where to go. They also officially opened a sandstone slot canyon once known as Mushroom Caves, because that is where the kids go to trip balls and climb through narrow canyons. It now goes by the more marketable name of Annie’s Canyon. We drove past my old place. The school has a new coat of paint and the duplex is no longer a duplex, but a new condo. The Mexican families are gone, and there are no kids playing in the courtyard of the multi-million dollar condominiums that replaced the old, cheap apartments filled with laughter, and day-drinking, and Saturday morning sweet bread. We had to park a little further down the road than I used to, but once we all hit the trail, the magic started seeping through our shoes. We ran to the Mushroom Caves, and squeezed between the sand walls, my youngest daughter asked for help a few times, with the wavering voice of fear, maybe claustrophobia, or a first-time experience climbing between steep, narrow, sand walls. We gathered at the top and looked towards the ocean and Ki’s and talked about the post-run smoothies we would order, then we ran down the back trail, my son running in front because he loves the downhill. We got to the bottom and he asked if we could do it again. My youngest daughter, who I expected to protest, nodded her head up and down and told me she didn’t want any help this time. We did it again, slower in parts, taking in some of the weirdness of the place. I ran back to the car with my younger son and daughter, while my older daughter and her friend continued under the freeway to the East side of the lagoon. The little girl who picked a yellow daisy and put it behind her ear is between cross country and track season, and needed a few more miles. When we got back to the dead-end road there was a family there, and the mom was asking directions to Annie’s Canyon. As I was explaining how to get to the canyon, her daughter walked up to us, she couldn’t have been more than 3 years old, and she asked me how to get to her canyon. I looked at the mom, and the mom told me that her name is Annie and she thinks it’s her canyon. It’s good they changed the name, it’s good that so many people have discovered this special place, and I’ll trade the empty trails for the kids who now know this trail as their own. Kids see their feet, their friends, their siblings, their parents, and a few places that are theirs. This special place is shared by everyone who has left a footprint in its sand, or traced the lines of sediment in the steep walls. It’s shared with the birdwatchers, and Instagram hikers, and first daters, and the little girl, Annie, excited to see her canyon, and with my daughter who shared the same excitement fourteen years ago when she picked the daisies, and with me as I make the drive past the nice condos and beautiful cars to the dead-end that marks the beginning of our place.